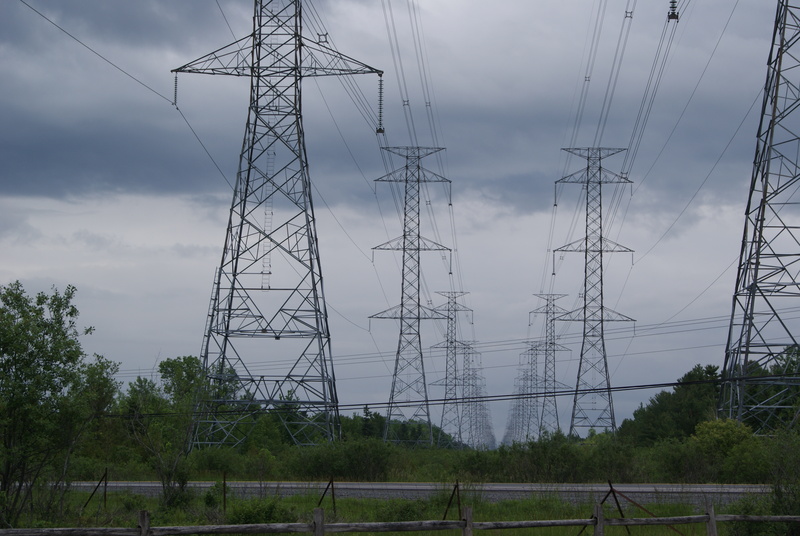 Hydro towers march through the landscape near Ottawa, Canada. Hyphens (-) are little dashes that have many uses. Compound words may be hyphenated (or they may be closed up together or they may be left as two separate words). Look in the dictionary for help. Use a hyphen to help the reader understand the sense of the word in context. Never use a hyphen after a word ending in —ly. Do not use a hyphen if the descriptors come after the noun. The home was high class. The game was hard hitting. The cheese was three years old. Hyphens mark words split between two lines of type. Pick up a newspaper. Find some hyphenated words and figure out what parts of speech are in the phrase. Henry hankered to measure the height of hydro towers in the right-of-way.